Lind’s Plumbing & Heating plumbing foreman Jesse Ennen checks the operation of a newly-installed hydroponic water-heating system at a recently constructed apartment at Housing Catalyst’s low-income housing project in Fort Collins on Aug. 9. With an unemployment rate of 2.6 percent, lack of skilled trades is a double-edged sword: It’s forcing wages up, a good thing for workers, but increasing the price of homes and apartments and delaying some projects that otherwise would bring housing inventory to Fort Collins. FORT COLLINS (AP) – A decade ago, L&L Acoustical averaged about 60 jobs a month. Today, the drywall company completes 35 to 40 jobs, not because the work is shriveling up – quite the opposite. There’s enough work to do 60 to 70 jobs in Fort Collins’ robust housing climate, co-owner Gery Lockman said. While work is plentiful, the workers are not. Lockman is wanting for laborers who don’t exist. He has an opening for three laborers but hasn’t gotten one application in three weeks. With an unemployment rate of 2.6 percent, lack of skilled trades is a double-edged sword: It’s forcing wages up – a good thing for workers – but increasing the price of homes and apartments and delaying some projects that otherwise would bring sorely lacking housing inventory to Fort Collins. “Costs keep going up; projects take longer to complete,” said Doug Dohn of Dohn Construction in Fort Collins. “Apartments that would have been built in 10 to 11 months now take 16 to 18 months,” he said. A July market update from the Fort Collins Board of Realtors shows the median sales price through July hit $418,175, up 4.5 percent from the first seven months of 2017 compared to the same period last year. In July alone, 224 Fort Collins homes sold for a median $430,000, up 6.6 percent from July 2017, when the median price was $403,360. Townhomes and condos appreciated faster from $280,000 to $300,000, a 7.1 percent increase for the first seven months of the year. A new statewide study by Shift Research Lab estimates rising labor costs account for about 30 percent of a project’s bottom line. The city is citing the study as it looks at its own strategic plans for housing. The clearest path to tamping down price escalation is simply to have more supply, according to the Shift report. But lowering or limiting the costs of development is necessary, the report states. However, it will not be sufficient to reduce the price of housing. One solution is to train more construction workers. In Colorado, every trade but roofing and glass contractors has seen precipitous drops in labor levels since 2006. Framing and masonry contractors saw nearly 50 percent drops in workers. Meanwhile, the average weekly wage has gone up between 10 and 25 percent, according to the report. Nationally, a typical construction worker in a nonsupervisory role earns about $60,000. But where to find the bodies is a national conundrum. Wage data suggest the construction labor shortage affects the specialty trades more than home building and contractor activities, the Shift report said. While he used to pay a drywall scrapper (someone who cleans up a site) $12 or $13 to start, he’s had to increase that rate. When wages go up, it can entice new workers into the industry, but that hasn’t happened yet. “There’s no one who wants to do the labor job,” Lockman said. 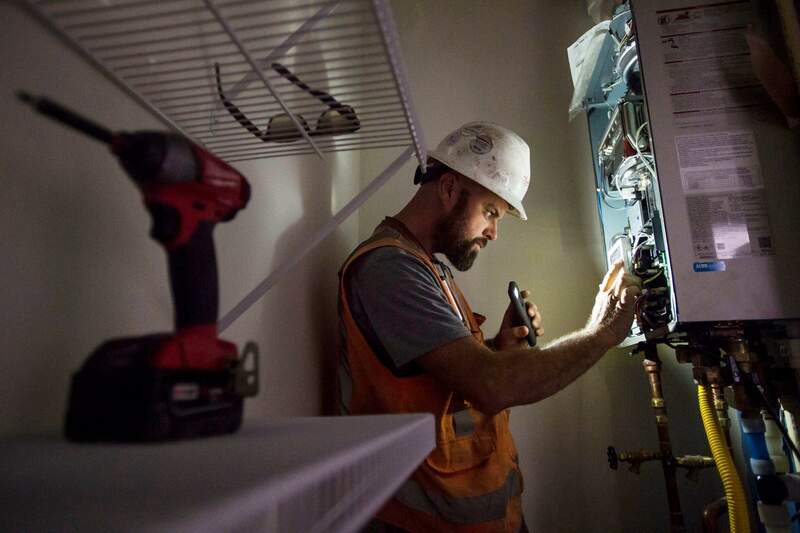 The shortage is a common problem for contractors, builders, electricians, plumbers and heavy equipment operators who have faced the shortage for nearly a decade with no relief in sight. Lockman, at L&L Acoustical, said he has workers from New Mexico and Texas, where construction is slower than in Northern Colorado. They come here, live in hotels, make a little money and go home. And in the construction business, reputation and reliability is everything. Kellan Moore, president and CEO of Lind’s Plumbing and Heating, is looking for a handful of workers, from inexperienced to journeyman plumbers. Lind’s is currently doing the plumbing for Village at Horsetooth, a housing project developed by Housing Catalyst for low-income residents. The average age for plumbers is about 60 years old, nearing retirement age, and there aren’t many younger workers lined up to fill the spots, Moore said. Lind’s is working with Thompson School District to create more trade classes and bring kids out of the classroom to the job site to show them what plumbers do. “They don’t know how fun it can be,” Moore said. “We’re still in an area that’s very desirable to live in,” Dohn said. There’s still demand and people willing and able to pay the price, “but we will see a point where prices might slow down our work because it doesn’t make financial sense any longer,” he said. While the labor shortage continues, the appraiser shortage has eased. John Mayea, who has been appraising property in northern Colorado since 1984, said there was a shortage right up until interest rates started to rise. When he started in the business, there were fewer appraisers than today and less work. “People didn’t use their houses as piggy banks back in the day,” Mayea said. Appraisers were stretched beyond the breaking point during the height of the refinancing boom, when interest rates were at record lows. Ron Harding got 20 to 40 appraisal requests per day during the refinancing boom. He could only accept one or two. Instead of a shortage, he calls it “an overabundance of work that no one was prepared for. It couldn’t last and it didn’t last,” he said. “Nowadays, that’s gone. There are plenty of appraisers,” he said. Realtors and lenders know to call for an appraisal immediately once a home is under contract to ensure there is no delay in closing the purchase, Realtor Ben Blonder of Fort Collins said. Now, as long as lenders and real estate agents are prepared, appraisals are getting done in a timely manner at a cost of between $400 and $700.